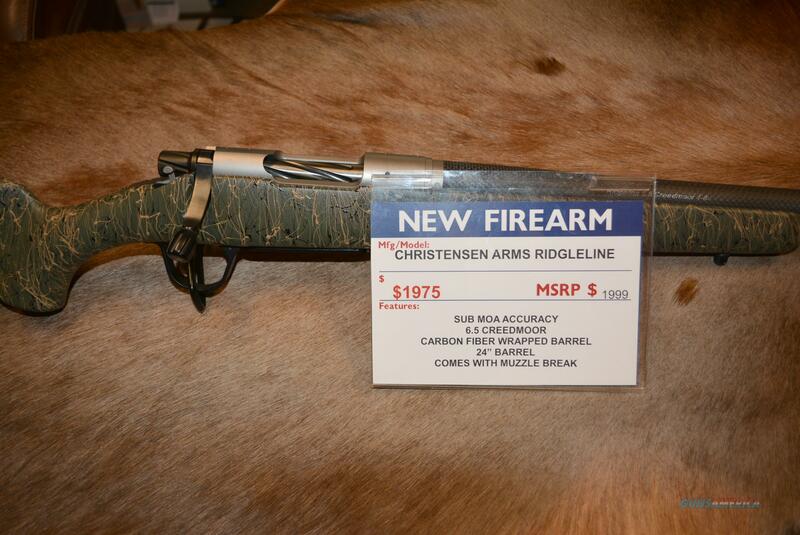 Description: NEW - Christensen Arms Ridgeline riffle - ACCURATE carbon fiber wrapped barrel. 6.5 Creedmoor - FLAT SHOOTER - Sub MOA gun. Check my other great listings! MAKE SURE IS LEGAL TO OWN IN YOUR AREA B/4 BUYING!!! We process online sales Tuesday - Friday, but we try to answer all questions asap! Photos are of the actual item unless otherwise noted. Additional photos available for serious buyers! 3 day non-firing inspection. Buyer pays return shipping and is only refunded actual purchase price if unhappy - If you have an issue – CONTACT US – We strive for customer satisfaction! We will ship to California BUT - ONLY if the item is LEGAL for CA residents to possess. Buyer MUST determine this before bidding. If you have any questions - ask BEFORE buying!!! Gun is for sale in our store, we try to pull it off online sites if it sells in house (but we are not always up to the minute). Purveyors of Quality Firearms. Authorized Beretta Shotgun & Sako Rifle dealer as well as Cooper rifles, Caesar Guerini shotguns, Sigarms, Pentax Scopes & US Firearms! We take Beretta\'s, Colt\'s, Sako\'s, Winchester\'s & other quality firearms in trade. See ad for actual shipping costs. Money orders prefered. We also accspt Visa, MC, Discover & AE with no upcharge. Check out our other great buys on this site! Hours: Mon-Fri 9-7 EST Sat 9-5 or by appointment. Trades possible - let us know if you have any questions!